Do you need help to remember the things you learn in each math lesson? Math Foldables give you a side-by-side view of how things are similar or different about each topic, and the videos below walk you through the math on each foldable. 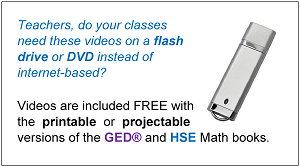 If you would like to have your own copy of the Math Foldables shown in these videos, you can find them with the GED® Math and HSE Math textbooks on the PRODUCTS page. Click here to shop as a student or click here to shop as a school. Do you prefer to watch videos on YouTube? Our channel is I'm Not Afraid Publications, Inc.
Is Facebook your preference? You can find these same videos on our Facebook page: imnotafraidpublications.